Golf clubs can be very expensive due to how many different clubs there are in a set. Drivers alone can cost more than you’ll pay for your irons, wedges and putter combined. And as a female golfer, there aren’t as many options available to you in the golf equipment world as compared with men. But don’t worry, there are still some great golf sets you can buy relatively cheaply, as a lady player new to the game of golf! Let’s get into the different club set options for women golfers below so you can compare the pricey options vs the low budget options. Here is the list of women’s golf clubs we will be reviewing below. 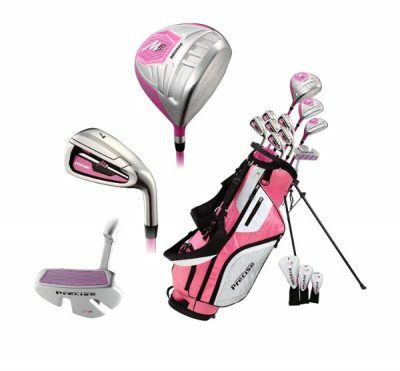 The Precise M5 Golf Club Set is an affordable, budget friendly option for beginning lady golfers and tops our list as the best complete set of golf clubs to buy. 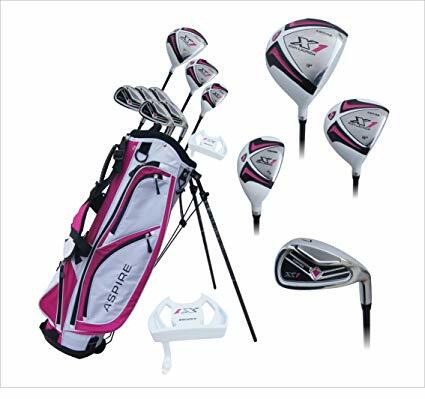 The first thing you’re going to notice is the professional, sleek design of these golf clubs and the pink color scheme makes them even more exciting to play with. They have additional color options if pink doesn’t suit your style! So who is the Precise golf brand? You’ve probably never heard of them but Precise has been serving happy customers for over 25 years and is a quality golf brand that builds complete club sets for beginner golfers. In this golf set you’re getting a 460 CC Titanium Driver which is a large club head to help you hit the ball better. It’s a forgiving driver that is easier for beginner players to hit! You’ll also love the ultra-light high modulus graphite shafts that are used in every golf club in this set. Graphite shafts are easier for new players to hit as compared to stainless steel, so you’ll find your swing speed performs better allowing you to hit the ball further. You’re also getting a color matching, dual-strap golf bag with straps which allow you to carry your clubs on your back. It’s lightweight making it easy to carry. Another bonus feature is the matching pink head-covers for your driver, wood, and hybrid that come with this golf set. This will protect your clubs and keep the noise down from your clubs clanking together as you’re walking the golf course. The first golf club set on our list is the Callaway Women’s Strata Complete Set. Callaway is one of the best golf brands especially when it comes to drivers. You’ll see many professional golfers on both the PGA and LPGA Tours playing Callaway branded golf clubs. The Strata set is perfect for beginner golfers as each club is built with more forgiveness to help your golf shots fly straighter on mis-hits. The stand bag is a stylish bag that combines a cool modern look, convenient pockets, tee holders and an easy to carry back strap which is everything you’ll need as a beginner player. Most golf bags can run a few hundred dollars alone so to have it come with your set of golf clubs all for a low price, is a great deal! The Aspire X1 Ladies Golf Club Set is perfect for beginners and high handicappers. It’s surely a game improvement golf club set. You’ll love the 460cc driver head to help you hit straighter shots. Bigger driver heads also give you more confidence when you set up to the ball visually! The Ultra Light High Modulus 100% Graphite Shaft is a perfect shaft flex option to help high handicappers hit the ball with more launch, getting the ball airborne. 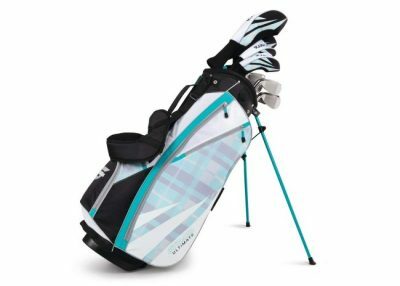 Next, you’ll find yourself enjoying the matching Deluxe Dual-Strap Golf Bag and Headcovers! Carry your bag like a backpack and with style! You can choose form pink, black, light blue and possibly other colors. 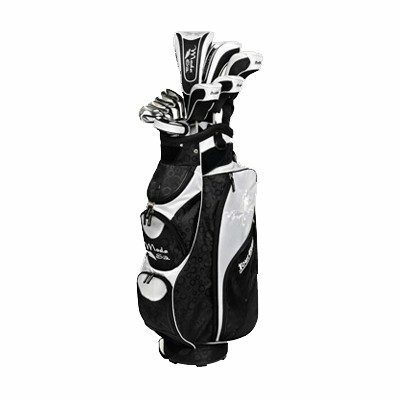 This is a 13 piece golf set which includes 9 clubs, 3 head covers and 1 golf bag. The next best women’s golf club set on our list is the Tour Edge Moda Silk women’s golf club set, which is a higher end, more expensive set of clubs. We’ve included this set to show you what a higher priced, game improvement set of golf clubs is like compared to the low budget game improvement options we’ve presented thus far. The design look of this golf club set is very professional, especially the sleek black color scheme above. But you can choose from multiple color options if you prefer light pink, light blue, or light grey. The shafts are designed with Moda Silk’s low kick, ultra-light graphite shafts to help launch your golf shots higher and farther on the golf course. The driver, woods, and hybrid are built for entry-level golfers to be very forgiving for more accurate golf shots. The club set is geared to help you with longer golf shots so they’ve removed the 4, 5, and 6 iron which are tough for beginner golfers to hit. Instead, you’ll find multiple woods and a 6 hybrid to make long distance shots much easier to play. Additionally, you are getting 6 head covers and the golf bag with multiple pockets for storing tees, golf balls, and shoes in an organized fashion. Which Golf Clubs Do Beginners Need In a Set? Every game improvement golf set should include the three core clubs: (1) driver, (2) irons, and (3) putter. These are essential for hitting tee shots, then hitting irons onto the green, and then putting the ball into the hole with the putter, obviously. As a beginner, you probably only need one golf wedge with higher loft that you can practice with and get really good with. As you advance your skills you can add more wedges to your golf bag. I started out with a 56 degree golf wedge, but I’ve since added a 60 degree as well for extra loft on flop shots and bunker shots! It’s also recommended you carry fairway woods and hybrids in your golf bag to help you with longer shots. Hitting long irons like the 3 iron, 4 iron, and 5 iron can be quite difficult for beginners to control and hit accurately. You may find that you hit a 3 wood or 3 hybrid much farther and straighter than a 3 iron. Hybrids are designed to fill the gap between fairway woods and irons so carry at least one in your golf bag to cover the distance gap between your wood and your lowest numbered iron. Read: Here’s another guide to read on choosing a new set of golf clubs! How Much Should You Spend on a Set of Women’s Golf Clubs? There are a lot of quality golf clubs being created for women players and if you were to look up the best on the market for each category (driver, woods, hybrids, irons, wedges, putters) you’d be surprised at how expensive it can be. The club sets we reviewed above are definitely the much cheaper option but in case you decide to spend more money on higher graded equipment, you’re looking at $2,000 to $3,000 in total spend. The EVNRoll putter isn’t a bad option for high handicap golfers, and women golfers who are new to the game. It’s face technology is designed to hit putts with similar roll and distance regardless of where it’s struck on the face. So if you happen to mishit on the toe or heel the ball should still stay on line pretty well and end up travel similar distance on the green as a center-struck putt. Overall, we recommend a budget of at least $300 for a set of golf clubs and expect to spend closer to $600 when it’s all said and done if you decide to choose a special driver or putter. This was the approach I took when I got my first set of golf clubs. I started with a basic, used version of Titleist irons and spent my money buying a putter and driver that would serve my golf game the best. Putters are used on almost 50% of your golf shots so it’s okay to spend a little more money here. And driver’s need to hit the ball straight and far. You should be fine with the beginner friendly driver that comes in most game improvement golf sets like we reviewed above. But if you like the TaylorMade or Titleist Women’s Drivers feel free to upgrade for a hefty price tag! Should You Spend Money on Lessons or Equipment? Another common question you’ll face is should you spend money on golf lessons? And if so, should you budget more money towards lessons or towards your golf equipment? If you’re a beginner and your golf swing struggles quite frequently, it’s definitely recommended you take golf lessons. Most beginners give up on the sport of golf because it’s too difficult and they couldn’t figure out how to hit the ball consistently. You should focus more of your budget on paying for golf lessons with a swing instructor. They charge hourly rates of $30 to $100 depending on the instructor. You should be able to buy a package of lessons at a discounted rate as well. For example, $200 may get you 5 golf lessons which can be spaced out over the course of a month to help you progressively improve your swing by checking in each week for a 30-45 minute lesson. As your golf game improves, you’ll benefit more from the technology in the more expensive golf clubs. But as a beginner you won’t notice a difference between a $500 driver and a $80 driver if you can’t hit the ball well. You can always upgrade your golf equipment later as your skills improve and you take the sport more seriously! Thanks for reading and make sure to check out our resources below that golfer’s love following to improve their scores quicker. We’ve helped thousands of golfers and look forward to helping you too!